looks like a really good booster. I like the resonance switch. It is nice. Although the idea of 6db minimum is somewhat off-putting. mirosol, where they plugged the pot?? And what pot? 100k log pot - output from the board to lug 3, lug 1 to ground and lug is the new output. :) I've built a few SHOs with added master volume, and it's really good like that. lug 2 is new output?? Lug 2 of the master volume 100k log pot to output. What would be a good low noise PNP? Would a 2N3906 do? ""For 25K RevLog you need 5x25K=125K Lin Pot and 25Kx1.25=31.25K resistor soldered on lugs 2 and 3""
Use linear. That'll work just fine. but put a 125k, with 31.25K resistor soldered on lugs 2 and 3 as Bibi said?? Linear is not the same as reverse logarithmic - but it will work just as well. I built mine with 20K linear, and it works. So by using a linear taper pot instead of rev log - you would just have to turn the pot to 2/3 instead of middle position on rev log. That doesn't affect the sound at all. Just how much boost you have on specific part of the sweep. then what is the advantage of a log Rev? the middle, is that 50% of the gain. Like i said, it only affects the feel of the sweep. For example; Log in this case would not feel very good, as most of the control would be in the last 10% of the sweep. is better to use 20k lin or 25k lin ??? Whatever you like, but 25K would be on par with the original. Built this pedal and am very impressed. It gives single coil pickups a full rich tone. Can also be used with Humbuckers. Thanks for the Post. There is no pulldown resistor on the schematic, nor on the layout. Place 1M resistor from input to ground. That should take care of it. Was it to be longer connected, and capacitors were accumulated with more power? It could also be the outpout. So pulldown resistor there could also help... Can't remember that mine was popping though. Already tested on input and output. With LED and without LED, continues forever. What happens is, when I turn on, it does "pop", then stay on a while, if I turn off and on makes no noise. If you let off a little and turn on it back to make pop. I put a resistance in input and output the 200k, but as a rule they told me, I should be put in 100k output, and an resistance the 1M in input. Good to hear you solved it! Usually 1M works in that king of situations, but for future builders, it's good to know that this one may need ~200K. Great!! 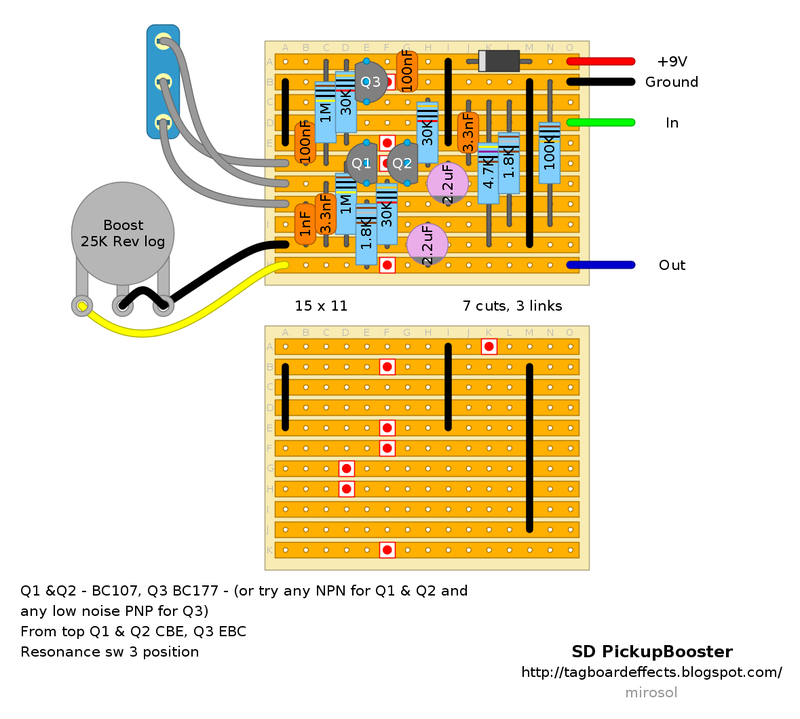 I have the original SD Pick Booster but want make one this and compare...can any one post sounds??? :-) Nice pics of Daniel Ludgero Pickup Booster! is possible by placing the second switch position, with more bass? Try swapping the 1n and 3n3 for bigger values. 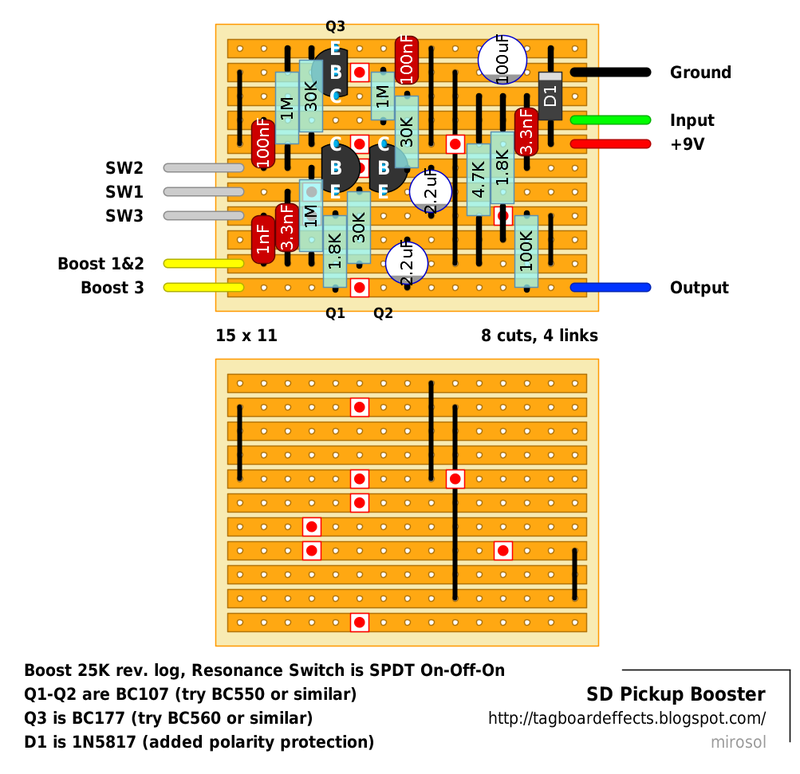 I'm using an original SD pickup booster in the effects loop of an Orange OR15. The minimum volume boost is much too much. Is there a simple way of decreasing the amount of boost? Probably a silly question, but am I right in thinking that the shunted cap at the input trick (=resonance control here) would work at the input of any booster/pedal in general to mellow down the tone at the source? SD has a new version of their pickup booster. You might wanna check it out. Hello guys, i only have 2N2907 and 2N3906, do you think will work fine with any of these? Either of those will work fine for Q3. For Q1 and Q2 you'll need NPN transistors. First, thanks for all the great posts. Q3 is PNP so the usual convention is reversed, emitter goes to the higher voltage, collector lower. My question is/was about Q1 and Q2. Thanks also for the link, though. You are missing the Q3 on that equation. If the Q1 and Q2 were wired as cascading amplifiers, then your question would be valid. But they are not. I've built a couple of these over the years and the layout plus the schematic are working as it should. pin 3 (the emitter) of Q2 is tied directly to +9V." Q3 emitter is tied to 9v, Q2 collector is tied to 9v and Q1 collector connects to 9v via 30k resistor. This is getting Kafkaesque! In the diagram, the topmost pin of Q2 should be pin 3, yes? If the transistor is CBE, then the topmost pin is the Emitter, yes? It is tied to +9V, yes? I know I am missing something. Everybody can't be wrong. If the top pin of Q1 and Q2 are collectors, then doesn't that make the pinout EBC and not CBE? I couldn't find a BC107 pinout for the TO92 package. However, the BC548, which is a plastic TO-92 equivalent of the BC107 according to Wiki, is a CBE. I am starting to think that Q1 and Q2 are reversed. Of course, it's hard to believe that this didn't get caught when folks built the circuit, so I still might be bonkers. Aha! You are looking at the schematic and I am looking at the diagram of the Vero board. So you're suggesting the vero and schematic do not match each other? Yes, unless I'm crazy. Q1 and Q2 need to be turned around to face the same way as Q3. Then, their pin 1 (collector) will then be connected to +V. I'm pretty sure at this point, but you need to sanity check me, of course. Maybe the best course would be to swap out the TO92 packages for TO18s if possible. I am guessing that when everyone built the boards they used TO18 parts and thus didn't detect the orientation. Of course, I could still be wrong. You be the judge. Many thanks again for all your work. It is impressive and much appreciated. I'm sorry to tell you but you are wrong and you have been all the way. Just look at the layout and look at the schematic. On both, Q1 has 30K between its collector and supply, right? On both, Q1 has 30K between its emitter and ground, right? On both, Q2 has its collector to supply, right? Emitter of Q2 is connected to Q1 emitter and thus, via 30K to ground, right? Emitter of Q3 is connected to supply, right? Layout has to match the schematic for it to work. If you are convinced that the layout is in error, then the Analogguru's schematic has to be in error. You should probably stop using pin numbers from transistor leads as they vary between 2N and BC models and are not standard. Just use the names - base, collector and emitter. Yes you're getting too hung up on the transistor graphic. The notes say that Q1 and Q2 are BC107's which are round metal can transistors and don't match the layout, but it suggests trying BC550's (and BC560s for Q3) which would be inserted exactly as shown in the layout. Q1 and Q2 with flat side to the left makes the pin out C, B and E from top to bottom as shown in the layout. Q3 with the flat side to the right makes it E, B and C from top to bottom, again exactly as shown in the layout. The orientation of the transistors is always going to depend on what you use. If you used 2N5088's instead then the transistors would all need rotating 180 degrees to those shown in the layout. But again as Miro and Travis have both said, it's the pin out that is important so make sure that matches the order shown in the layout no matter what you use. I bow to your expertise although I still can't see it. If you have checked it and are satisfied, then we're good. If I may ask, what software are you using for your Vero layouts? I've looked around the site, but didn't see any posts. It is rather small circuit, so building it isn't too big of a task. That way you could see it works for yourself. Thanks to everyone. I must be too dense to grasp the concept of CBE. Everyone can't be wrong, right? It must be me. I had my say and I think that everything productive and positive has been explored. I apologize if I have injected static into the forum. It wasn't my intent. Thanks once again, Mirosol. I'll give it a try. ehy guys...50k pot should works good? i would solder a 50k resistor between lugs 1 and 3 to make it kinda 25k pot. 50k pot might distort after 12 o'clock settings. I know that i should socket and try...but i'm putting the circuit onboard my stratocaster, under the pickguard, and trying it's too hard..
Hey! somebody here said that minimal 6db of boost is to much for him. But what if we just change boost pot on link and add master volume pot after output of circuit? if my idea is correct it will be same boost pedal but with opportunity of any wanted level of volume. what do you think about that idea? so say I wanted to put this into a guitar. I'm using a B500k push pull. I used a 51k metal film resistor and soldered the outer lugs giving me the resistance of approximately 45k to "solve" the decibel issue. However I'm having a hard time wrapping my head around the last little bit. How would I be able to switch the battery on and off. It's an onboard preamp I'm trying for. I tried the "true bypass" method below which I know it makes no sense considering this pedal is better as a buffer but as we can tell I'm really new to this. so I get my guitars sound properly , all the connections are fine. That is when I pull up on the push pull. when i have it down I get no sound at all. should I just have the switch for the battery on and off? or what would you guys do. I wired the B500k pot backwards to get my way around the "C" pot taper type , the decibel issue as in going from 3 to 25db instead of 6db to 25db. but would i do with a push pull to get it to work. this is my first build, but I am quite happy with he result. I use it between my guitar and my tube amp (Kustom defender) and it really takes it to a new level of distortion that I was waiting for. The case is a cooking device from French army. The knob comes from an old tube radio receiver, and the light comes from a new old stock I got. Hello I built it but there is a little boost maybe a fault and I am not an expert.q1 9-4-4v q2 9-4-4v q3 9-9-4v is this right?